Firms are a ubiquitous feature of the economic landscape, with much of the activity undertaken within an economy taking place within their boundaries. Given the size of the contribution made by firms to economic activity, employment and growth, having a theoretical understanding of the nature and structure of firms is crucial for understanding how an economy functions. 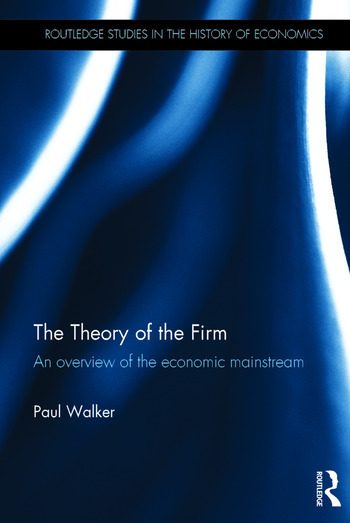 The Theory of the Firm firstly offers a brief overview of the past, consisting of a concise discussion of the classical view of production, followed by an outline of the development of the neoclassical - or ‘textbook’ - approach to firm level production. Secondly, the ‘present’ of the theory of the firm is discussed in three sections. The first section considers the post-1970 theory of the firm literature per se, while the second section scrutinises the relationship between the three most prominent of the modern sets of theories: the reference point, property rights and transaction cost approaches. The third section looks at the theory of privatisation. The unique aspects of this book includes its discussions of the post-1970 contributions to the theory of the firm; the integration of the theory of the entrepreneur with the theory of the firm; and the theory of privatisation. This volume offers an intuitive introduction to the theories of the firm as well as simple formal models of the most important contributions to the literature. It also outlines the historical evolution of the traditional and modern theories of the firm. This book is of great interest to those who study history of economic thought, industrial economics and organizational studies. Paul Walker is an economist in Christchurch, New Zealand. He received his PhD in Economics from the University of Canterbury, Christchurch, New Zealand. His research is mainly on the history of economics and the theory of the firm.